In the past year or so, I have been inspired to strip most things in my life, back to basics. Living a more minimal mindful lifestyle, with less of an impact on the environment, my mind and my body. This has meant letting go of things I once thought were “essential” to my every day life, and somehow to my happiness. That’s exactly where the problem was. Feeling like material, external ‘things” were essential on the path to happiness, this is a very dangerous road to go down to. You do not “NEED” the latest handbag/phone/dress/TV/food processor/fancy eye cream… the list goes on. The media makes you think you do, and they do a very good job at it. Millions of dollars go into advertising, making you feel less than if you don’t have the latest product, the latest this and the latest that. In the beauty industry, especially, a lot of the latest products are actually more harmful than ever (did you know that in the term “perfume” or “fragrance” over 100s of chemicals can be ‘hidden’ and not listed?!) If you’re interested in this topic, I would highly recommend the book called “No More Dirty Looks” and download the app “Think Dirty” which rates most beauty products out there, and flags out ‘toxic’ ingredients! This isn’t a new concept, and it’s not rocket science either. You will be amazed at how truly free and light you’ll feel once you detach yourself from it all (one of my goals in life is to truly detach myself even if for a time, and own a cabin in the woods somewhere and just BE.. anyone can relate?!) You will be amazed at how much time you’ll have left to dream big, look after you body & mind, and feel happy. I believe that the transition for me started when I first went vegan. Once I realised I’ve been basically lied to my entire life (by society/the media/big corporations) about what my body truly needs, and once I understood the power that big corporations have to make you believe anything they want, that’s when my brain flipped upside down and I truly believe I felt a sense of awakening. This is one of the reason I think, why most people who have gone vegan will tell you it’s the best thing they’ve ever done, because it has a ripple effect over your whole life. I started being more aware of what I was putting IN my body, and slowly I became aware of what I was putting ON my body. Not only from an ethical stand point (has your favourite cream been tested on live animals? rabbits, dogs, cats, mice, guinea pigs.. the list goes on. Look into animal testing you’ll be horrified) but also from a health perspective. Did you know that your skin is your largest organ? Have you ever looked at the ingredients on the back of your creams/gels/potions? If you don’t recognise half of them and you don’t even know how to pronounce the ingredients, it’s probably bad news. At the core of it all, I truly believe that good skin comes from the inside out. The foods you put in your body reflect on the outside. You are what you eat. Literally. Do you want bright, plump, youthful, beautiful, vibrant skin? Eat foods that are these exact things.. bright, beautiful and vibrant! Eat the rainbow! Treat your body like a beautiful garden as opposed to a graveyard. Eat a plant-based diet full of healthy fiber (insoluble & soluble fiber! ), complex carbohydrates and introduce fermented foods such as Kimchi, Tempeh, miso, sauerkraut, kombucha..
Eat as organic as possible, reduce or eliminate processed foods, and go easy on the gluten. Now let’s get started on what my simple beauty routine actually looks like! This is something that I’ve been doing for the past 6 months, I am always fine tuning it. Your skin is a living thing, no two days are the same, so I always address my skin on a day-to-day basis, is it feeling dry? is it feeling flakey? is it feeling plump? is it looking a bit dull? do I have breakouts because of my hormones? Listen to your body, observe, be kind to it and it will be kind to you. This has been a revelation to me! I discovered oil cleansing not too long ago, and I now swear by it! Anyone with oily skin, fret not. A little chemistry for you, you can only dissolve oil with oil, not oil with water..! Massage a tsp worth of oil (more or less) onto your dry skin (with dry hands too) massage in circular motion for a minute or 2 until your skin is saturated with the oil. Place your face cloth under very hot water (mind your fingers!) quickly wring it out, and place it open on your face! This will create steam which will open up your pores and cleanse all the oils and impurities trapped in your skin. Leave the cloth until it cools, then gently wipe away your face and any makeup if you were wearing any with the corner of the cloth. Repeat the steam phase one more time if necessary. A light film will be left on your skin which is deeply nourishing and calming for the skin. Do a little research as to which oil, or oil blend (you can make this yourself!) works best for your skin! I do this once a day in the evening. I buy my oils in bulk, and transfer them to these travel size bottles, so they’re easier to use and take away with me. Now, sometimes I either feel like I need a water based cleanser, maybe because I wore a lot of makeup that day for example. In that case I like to cleanse first with this Fabulous Face Cleanser by Aesop, and then do my normal oil cleansing. 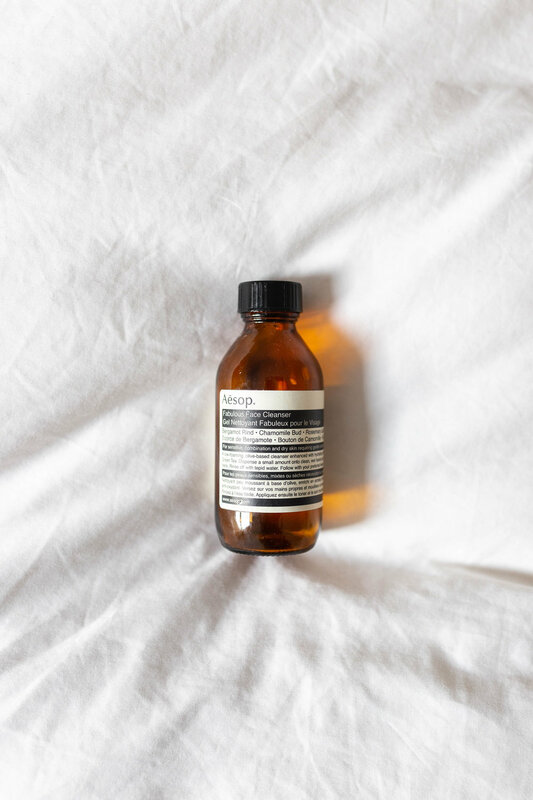 I’ve been using this product for over 5 years, it’s so gentle on my very sensitive skin, it smells like heaven (like everything that Aesop makes!!) and it’s so beautiful.. i’m a sucker for beautiful branding and packaging. 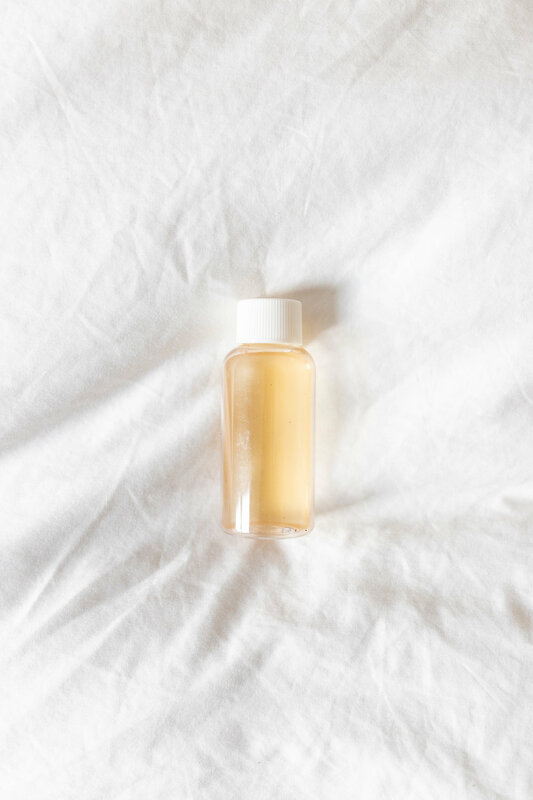 OR I’ll sometimes cleanse with this in the morning, and then do my oil cleansing in the evening.. it depends how my skin is feeling and it depends on the day. Given this smells like a mix of Bergamot, Chamomile and Rosemary (3 of my favourite scents) I can’t resist! I also alternate with this super gentle cleanser, especially in the winter months when my skin is drier. It makes you feel like you’re at the spa and comes with a cotton cloth.. the technique to use it is very similar to the oil cleansing, but this is more like a balm/cream. Try it! I used to use fancy toners, with a million ingredients in them, and then I discovered that I could use something that I have in my fridge at all times. An ingredient that has been used for thousands of years : Apple Cider Vinegar! 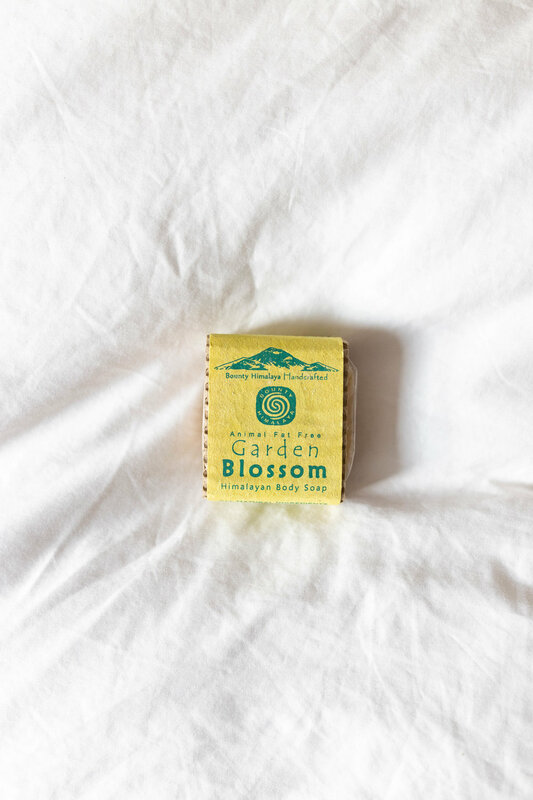 It has strong antibacterial properties, it balances your skin’s PH, it’s gently exfoliating, and is also known to reduce scarring and sun spots… when I discovered that, I was sold. I use organic, raw and unpasteurised apple cider vinegar. This one is the best in my opinion. Once open I keep it in the fridge. But to make my toner, I use a 1:1 ratio with filtered water. It’s a little too strong to use by itself. You can also start with a lower ratio if you want to ease into it. 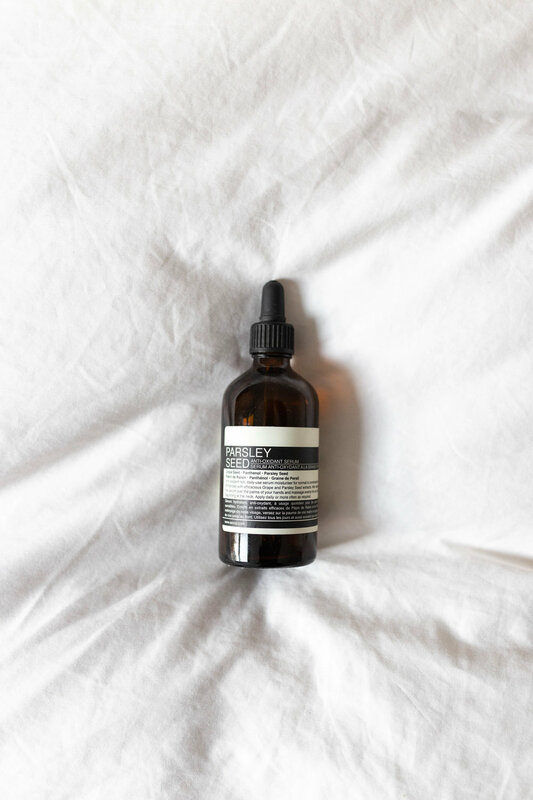 Don’t worry too much about the vinegar smell at first, you’ll get used to it, but also once you apply your serum/moisturiser, the smell disappears completely and your skin is left smooth as a ever. I have a love affair with this Parsley Seed serum. The first ingredient is aloe vera, which you might know is basically your skin’s best friend! I am actually growing a huge aloe vera plant at home, to be able to use some of it’s leaves for my skin. This serum is highly anti-oxidant, which my skin desperately needs living in London with high levels of pollution. It’s super light, and sometimes in the summer, after cleansing and toning I can get away with just using this and no moisturiser, because it’s super hydrating already! I definitely don’t use this everyday, but most! When I remember..! 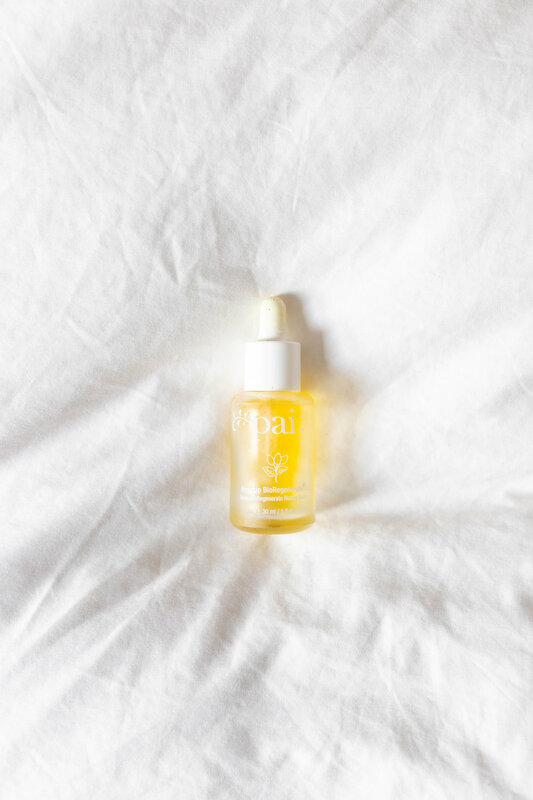 I also LOVE this Vitamin C serum, by this super natural brand, which is also vegan. It’s made of only clean ingredients. Here comes my addiction with face oils! I could probably do with just one of those, but I love trying new ones, and I also love to blend them and create my own little potion! Here are my three tried and tested ones that I absolutely love and use all the time. Jojoba Oil : You pronounce this one ho-ho-ba which I’m still confused about but it’s worth putting out there if you’re going to ask for it in a shop! 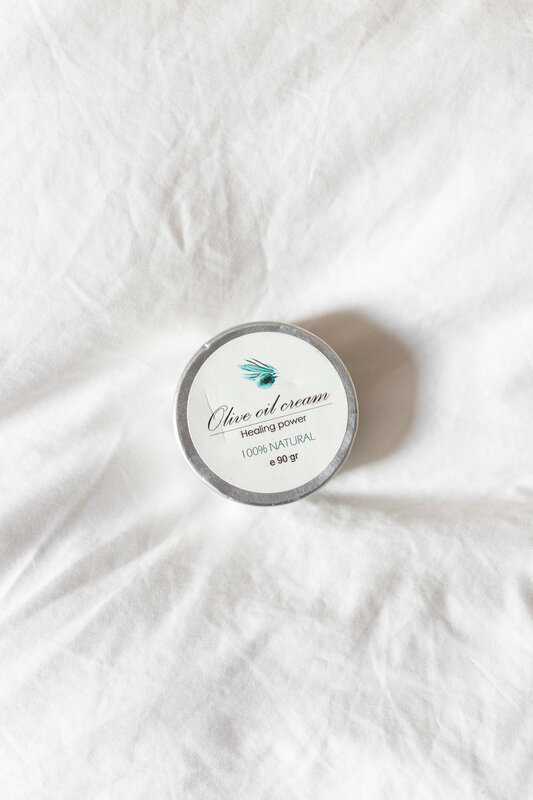 ;) This is not technically an ‘oil’ but a natural ‘plant wax’ which closely resembles human sebum, it helps to regulate your naturally occurring oils and it helps to dissolve clogged pores..! Jojoba oil would also make an excellent oil cleanser, but given it’s a little bit more expensive I just use it as a moisturiser. I would be lying if I told you that I did this every single day, but like yoga and my meditation practice I’d really like to make it a daily routine. It is an ancient practice, it has some amazing benefits, such as supporting and cleansing your lymphatic system, it stimulates the lymph flow by moving things around. Of course it exfoliates your skin, be prepared to feel smoother than ever before! (if I can’t have access to a Morrocan hammam every week, this is the next best thing!) It also reduces cellulite, and makes you feel energised! I make sure to do this in the morning before my shower. Make sure to wash the brush every few weeks too, I just chuck mine into the washing machine with my clothes. You can also let it air dry in the sun (if possible) which will help kill bacteria. This is the brush I use. In the shower I often use natural soaps, like this one my dad bough me from Nepal which is amazing!! (also love this one and this one!) It’s made with : coconut oil, castor oil, chuiri oil, sesame oil, sunflower oil, lemongrass oil, neem oil, garden herbs (!?) and floral essential oils. It’s one of my favourites! It leaves my skin feeling so moisturised, and not ‘squeaky’ like a lot of soaps do! I’ve mentioned this before but I also often make my own shower gel, following this recipe (I just take out the honey or add full fat coconut milk), but Hello Glow has so many amazing recipes to try out! It’s much easier than you think, and buying your ingredients in bulk makes it so much cheaper! I’ve started to end my shower with cold water for up to a minute, which is super energising and immune boosting! It’s rich in essential fatty acids which makes it your ally to balance your hormones. Some women actually use it to help relieve PMS symptoms! but because it helps balance your hormones it’s really amazing to help acne prone skins, as well as skin conditions such as eczema and psoriasis. Which I’m not an expert on either, but worth doing a little research if this is something you’re dealing with! if you are though I would always recommend you check with your doctor before taking any supplements to treat any conditions, also especially if you’re pregnant/breast feeding! I learned today that in the 17th century in Europe this plant was called “King’s Cure All'“.. that’s how powerful this flower is! Do your own research but it has some amazing benefits. Like any pills and supplements I also always check that the coating is vegan and not made with gelatine! 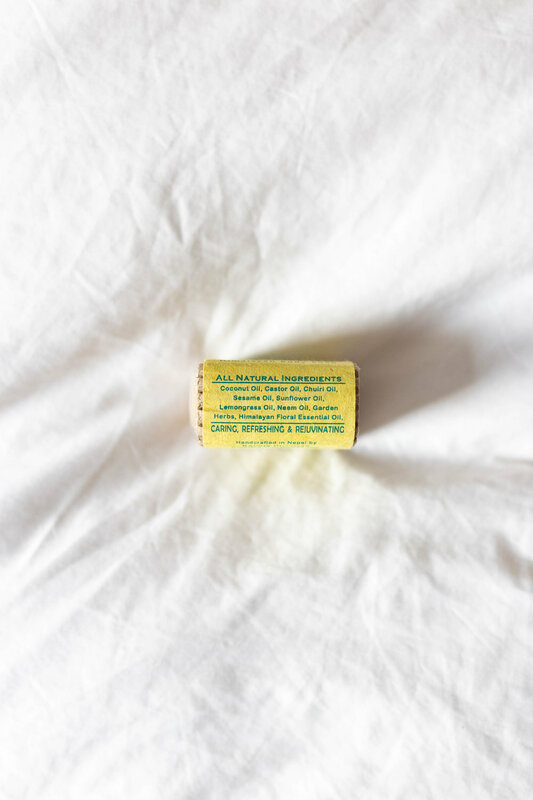 Oh this balm! I could write a poem about this balm, but I won’t for your sake.. It was given to me by Michael’s mum who is also a natural beauty convert, and I’m not entirely sure where she bought it, but all I know is that it’s magical! I’ve used this on cuts, on chapped lips, red nose when I have a cold, on dry elbows, on the tips of my hair, on a pimple (it contains lavender oil which is antibacterial) as a deeply hydrating mask if I’m feeling very dry (for example in the winter, when skiing!). I won’t go into too much details because I can’t link the exact product, BUT after an hour of research this afternoon I found something SO close, and praise the universe, it’s cruelty free and vegan too! Here’s the Superfood Balm by My Roo. It’s very similar to this one from the ingredient’s list, and I’m going to order some to try it out and let you know, but I’m already hooked with this beautiful brand, UK based, called My Roo (not sponsored at all, I literally just found them!) Check them out! splash face with cold water (or cleanse with The Fabulous Cleanser) if I’m having a shower in the morning, I will end the shower with 30 seconds to a minute under cold water, face included. Tone with the apple cider vinegar mix. Apply my serum - let it dry while I brush my teeth. 2 drops of Squalane oil and 2 drops of jojoba oil massaged into my skin. While I do this I also take the time to give my face a little massage in circular motion going down towards the heart. 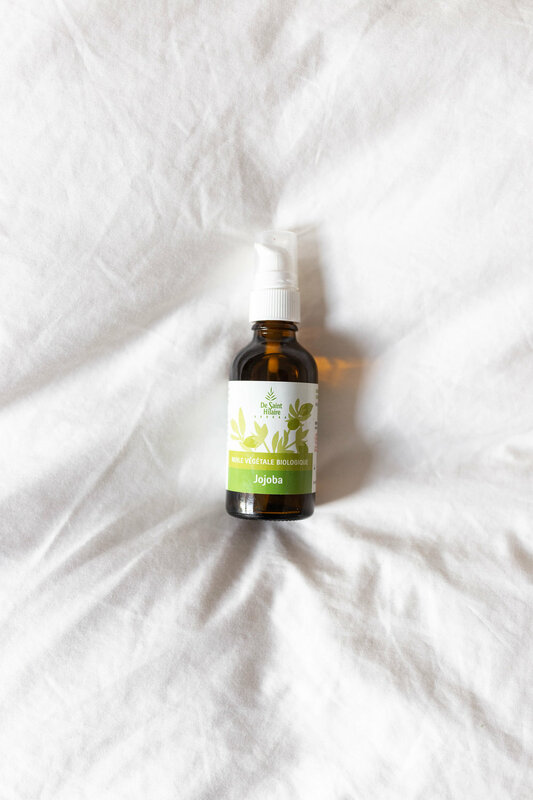 This helps your lymphatic system, and ‘depuffs’ your morning face. Oil Cleanse with almond oil. Tone with apple cider vinegar mix. Apply balm to my lips and hands, put my phone away and BEDTIME! That’s it for now! I hope this helps and is informative enough that you might discover something that works for you. Like with anything, I advise you to do your own research, try things out, listen to your body and your intuition. Nothing makes you feel more empowered than taking charge of your health and your body, and feeling good inside and out. If you have any questions, let me know in the comments below! I’ll try and answer everything!